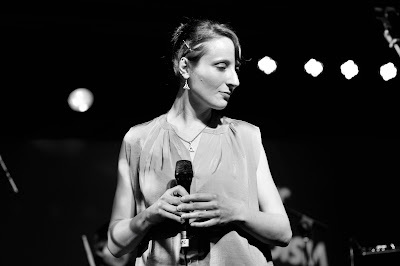 LondonJazz News: Sarah not everyone knows the Intakt label - please tell us about it? Patrick Landolt is the founder and was recently recognized officially by the city of Zurich for his important contribution to music, and a ‘‘General Cultural Merits Award" was bestowed on him. Independent labels are much appreciated by musicians and listeners who are never tired of re-exploring, re-discovering and re-defining contemporary jazz. I believe `Intakt Records` is a label that represents these kind of musicians and listeners alike. LJN: What else in the Festival / which other concerts would you say people definitely have to go to ? SB: Highlights of the festival will be Swiss musicians that have for decades formed, innovated and kept alive the spirit of Jazz in Switzerland and beyond, like the amazing Irene Schweizer who has dedicated her life to the avant-garde or Barry Guy who will celebrate his 70th birthday during this festival. And some amazing Jazz musicians from the London scene are playing as well, i.e. the legend Evan Parker, who will be playing with his powerful saxophon voice, or Ingrid Laubrock who will be flying in from New York and many more. LJN: What is your own involvement with Intakt Records? SB: I am a young member of the 32 years old Intakt Records label since joining it in 2014. Since then I have released two albums on it with my Swiss quartet of Stefan Aeby on piano, André Pousaz on double bass and Lionel Friedli on drums. We have worked together for almost ten years now and each one of them has created a name for himself in and out of the Swiss jazz scene. They are brillant musicians and I am very happy for their wonderful commitment to my musical adventures. We recorded a debut album called THALi (Unit Records, Switzerland, 2010) which was influenced by my studies in India in 2005-2006 and 2008. After that, the first album released at Intakt Records was called Flying Letters (Intakt Records, 229), which I composed while living in New York. The second album Shadow Garden (Intakt Records 259) I wrote while living in London. SB: I will be involved in two performances at the Intakt Records Festival London 2017. The first performance will be with my Swiss quartet Shadow Garden. For the second performance I was tasked to create a collaboration with musicians from the London jazz scene. This is an important factor of the festival, to bring together Swiss musicians with like-minded musicans over here in London. Since my husband has been working in London for 3 years, I have been forth and back to London. and over the last two years I have met cellist Hannah Marshall and vocalist Lauren Kinsella – the latter I have known since 2008 when I lived in Dublin. I wanted to work with two string players and another vocalist and so they asked John Edwards to join us and I am very delighted to get the opportunity to work with these brillant musicians. It has really been a fantastic experience so far to rehearse with these wonderful people. LJN: Is there a fundamental difference between the two projects? - For the first collaboration with London-based musicians on Friday, 21st of April. I have written some sketches of music with lyrics to create a flow and storyline, respectively to weave our improvisations into. The first and the last song Luna and Breath of the Moon are dedicated to the moon and the powers which humanity has ascribed to her. My song Nova guides us through the birth of a star and the song Poseidon`s Throat describes the actual event of a rebirth. As you see they are clearly all material for avant-garde music. - Shadow Garden will be playing on Saturday, the 22nd of April. We will play mainly the music from our present album called Shadow Garden. This music has been described as a light-footed approach to the big issues, orbiting around existential matters with poetical texts and rediscovering itself in streams of words, vocalese, sounds and rhythms. We ll also play a few tunes from the older CD and might give a quick preview of the music of our up-coming album that will be a septet (the existing quartet with three string players added.